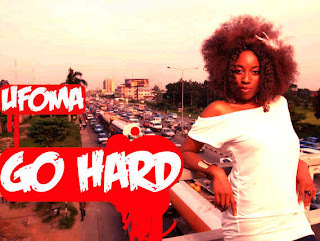 UFOMA GIVES FANS CHRISTMAS PRESENT WITH LONG-AWAITED MUSIC VIDEO FOR "GO HARD"
Before we enter into 2013, US-based Nigerian Singer/Songwriter and self-proclaimed ‘Afro Queen’ UFOMA finally debuts the long-awaited music video for her excellent 2011 single “Go Hard” which has been a regular fixture for listeners and on radio playlists up and down the country all year. Shot on location in the beautiful garden city of Port-Harcourt, the music video continues in the same vein as the single and aims to motivate the viewer and get you all pumped up for 2013! Featuring fight scenes that are reminiscent of the classic Brad Pitt movie Fight Club as well as an energetic performance from Ufoma accompanied by her electrifying live band, this music video is just what you need to get you up and going through the final few days of 2012 and roaring well into 2013! The song itself - one of resolve and resilience, calling out to its listeners not to give up on their dreams and to win against all odds - is a great showcase of Ufoma’s vocal dexterities and song writing abilities as well as beautifully laced with catchy keyboard arrangements, heavy guitar strings and lush drum kicks which give the song a very distinct Pop-Rock feel upon which Ufoma shines brilliantly. As with the audio release a year ago which garnered support from online and radio tastemakers alike, fans, critics and listeners of good music across Africa should find some appreciation in this new visual experience from Ufoma. Press play on the brand new visuals below and make sure to “Go Hard” into 2013!